Samuel Yam is co-founder and CTO of Patreon. The most-watched Game of Thrones episode ever, this past season’s finale, had 8.11 million viewers. Meanwhile, Pentatonix, a musical a capella group on YouTube since 2012, gets 10 million views each week. The most watched episode of 30 Rock on NBC — its series finale — had 4.8 million viewers, while Ryan Higa, a comedian on YouTube, averages more than 9 million views each week. Then there’s PewDiePie, one of the top YouTubers who makes the most awesomely odd gaming videos, drawing almost 90 million views each week. My point isn’t that these personalities will eventually replace premium content — there will always be a place in audiences’ hearts to watch someone’s eyes getting gouged out in Game of Thrones — but rather that YouTubers and independent artists have been commanding comparable audiences to premium content for a while now, and via a vastly different approach. When Alex Day — whom you probably still haven’t heard of — released his album on the same day as Justin Timberlake’s latest album, 20/20 Experience, Alex debuted higher on the iTunes charts than Justin Timberlake. Timberlake isn’t going anywhere anytime soon, but Alex was able to dominate the charts because, despite not having as large a fan base as Timberlake, Alex’s fans care deeply about him. They have a frequent window into his life via YouTube. So when he asked them for support by downloading his album, their response was immediate and immense. Fans respond better to genuine and direct connections to artists and celebrities. Stories like Alex’s are not rare these days, and individuals amassing fanatically passionate audiences are occurring internationally, across cultures and market verticals. YY, a more than $3 billion market cap company built on live-streaming karaoke personalities and gamers, regularly sees fans donate hundreds of dollars for a virtual car or rose to appear onscreen. Twitch, now owned by Amazon, allows fans to subscribe, but streamers actually go off-site to find tools to allow their fan bases to donate one-offs and put messages onscreen. YouTube — huge props for this — is standing up for creators by finally highlighting them to their subscribers on the mobile app after crushing it in the last earnings report on watch time and mobile growth. Reddit’s recent mishap was in a large part because of opposing views on how to take AMAs — when fans ask direct questions to high-profile figures, from Snoop Dogg to President Obama — to the next level. The common thread among all these companies is a recognition that fans respond better to genuine and direct connections to artists and celebrities. With numerous services available — Facebook, YouTube, Twitter, Snapchat, Instagram, Vine, Periscope — that enable artists to share more frequently the inner workings of their lives and minds, fans are savvier than ever, and they expect authenticity from those they adore. And they revolt spectacularly when this authenticity is absent. 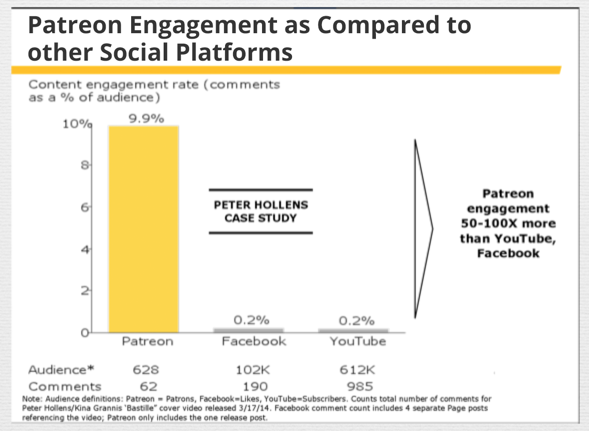 When artists and celebrities directly interact with fans, audiences respond with higher support (in the case of the data below, financially) and exponentially higher engagement levels. We did a study among our top creators and found that — as expected — financially supportive fans engaged up to 100x more. 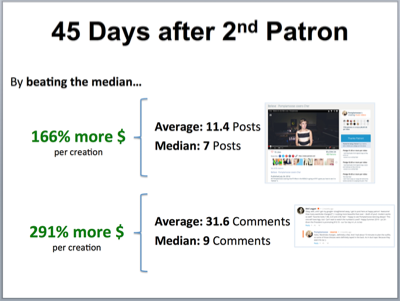 What was interesting, though, was when creators made more posts and comments than the median, they received more than 200 percent more financial support. At the end of the day, the ability for artists and celebrities with staggering audience reach to be able to directly connect with their fans truly opens a new level of interactivity and intimacy. What’s really exciting, though, is how this enables myriad sustainable niche creators who have fanatical supporters that are deeply passionate about whom they support. 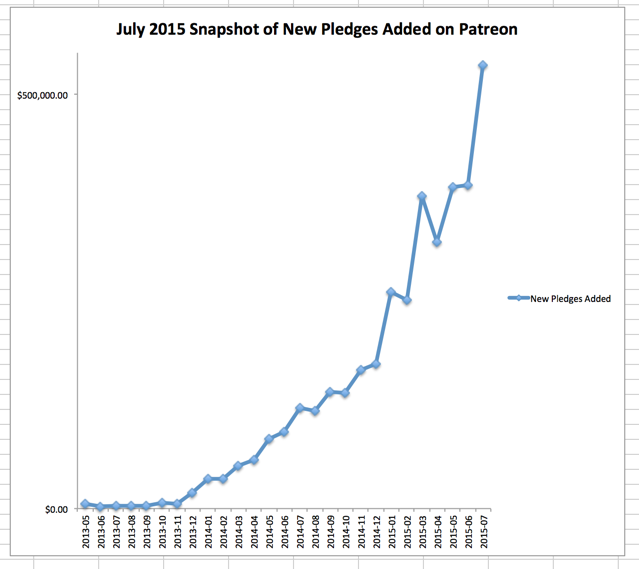 I’ve seen this unfold over the past several months as more and more financial support is pouring in for artists and creators who make educational content, comedy videos, music, web comics, gaming reviews, furry-friendly animation (!) and everything in-between.